Hello and welcome to another great review here on Drones World! Today our product of discussion is the amazing JXD 509G from Pioneer. This toy quadcopter was one of the very first to introduce Altitude Holder feature. Before its release, Altitude Holder was a function that could only be found in high-budget drones. However, Pioneer changed this, by being one of the first companies to introduce such a powerful and useful feature in affordable toy drones. JXD 509G is also an excellent choice if you are looking for an FPV (real time video transmission) drone with a complete FPV package ready to fly out of the box. Besides this, JXD 509G is also an excellent looking quadcopter, a neat and futuristic design which will amaze many at the park. This being said, and without further due, let us move on to our JXD 509G review! First of all, let’s discuss Pioneer JXD 509G set of features. As expected from such a powerful toy quadcopter, 509G includes four useful features. Headless Mode (for easier orientation despite where the front of the quadcopter is pointed at). One-Key Home Return (JXD 509G returns to pilot). Automatic Landing (basically does what it says it does, the drone lands itself) and of course Altitude Holder. What is Altitude Holder? Well, JXD 509G comes with a high-density air pressure sensor which can precisely hold the height, allowing the drone to maintain same height autonomously while the pilot focus on the camera). Such feature is also known as Barometer Set Height and is especially useful in camera drones since it gives the pilot more freedom. On top of all these great features JXD 509G also comes with, more standard, LED lights for night flights and 360º aerial spin with just the push of a button on the remote controller. Now let’s move on to discuss another important aspect of JXD 509G, its camera, and First Person View transmission. As previously mentioned Pioneer JXD 509G comes with a complete FPV package ready to fly out of the box that includes camera and FPV monitor. Most affordable toy drones make use of pilot’s smartphone to display the live video. But not JXD 509G, it comes with its own LCD screen while still keeping the drone’s price relatively low. The camera is 2MP with a 720p resolution; it have fairly decent image quality but may have a slight ‘jello effect’ consequence of the flight conditions. The live video displayed on the monitor has practically no latency and good quality; it will very well please most casual pilots. Pioneer JXD 509G is one of the best FPV toy quadcopters aimed at beginners, it’s easy to control, has a stable hover thanks to its functional 6 axis gyro system. If you are a beginner looking for an easy to use quadcopter to learn and practice, or even if you are just looking for a present to offer to a new drone enthusiast, then you will be very pleased with Pioneer JXD 509G. Besides all the great features mentioned before, this amazingly affordable toy drone also makes use of a 3.7V 600mAh Li-Po battery. Such battery powers up to 10 minutes of flight time, slightly above the average length for drones within this price range. JXD 509G range is also slightly above average, 150 meters of control distance will be more than enough for you to enjoy the most of this quadcopter. 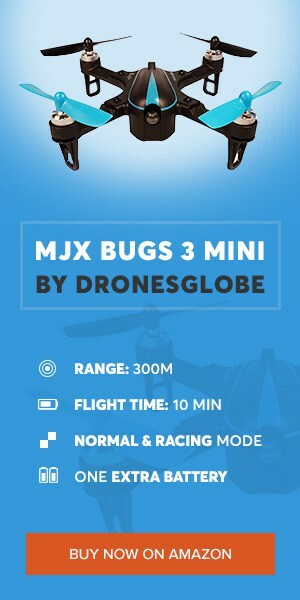 The average range for drones within its price range is 100 meters, so once again JXD 509G slightly stands out from the rest! Take into consideration that One-Key Home Return feature will be useful due to the 150-meter range, once you lose eyesight of JXD 509G, you can quickly and safely make it fly back to your position. THE GOOD Pioneer JXD 509G is one of the best quadcopters within its price range. It packs a wide set of features including the uncommon Altitude Holder function and Automatic Landing. On top of this it also has a flight time and control distance slightly above average. Up to 10 minutes of flight time and 150 meters in control range. JXD 509G comes with a complete FPV package ready to fly out of the box. THE BAD JXD 509G 2MP camera may have an occasional ‘jello’ effect, especially notable on the recorded video, not so much on the live video. BOTTOM LINE Overall, Pioneer JXD 509G is a great purchase to anyone looking for an FPV drone with Altitude Holder function, packing everything the pilot needs to fly out of the box. On top of all this goodness, it still is very affordable. A great value for your money. Pioneer JXD 509G quadcopter is one of my personal favorites. It was one of this first quadcopters to introduce a wide set of features including Altitude Holder and still having a low price tag on the market. It excels in many aspects such as flight time and control distance, and it surely ranks as one of the best within its price range. What is your opinion on this JXD 509G review? Were you aware that this drone was out there on the market? Have you ever flown one or are you considering buying it? Let us know in the comment section below, we at Drones World love to read your comments and discuss the products we review. Also, bookmark our page for more weekly guides, reviews, and news here on Drones World. Our aim is always to keep you informed and guide you through your choices. Happy flying fellow drone enthusiasts!